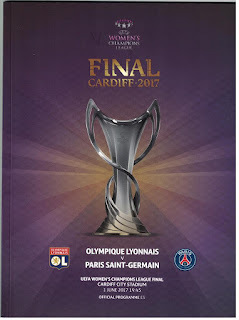 After reviewing my 25 years of going to football matches I went through my boxes of old programmes to scan a few for a post about memorable matches. And I found a lot of other games that I remembered, and some that I didn't. Here's a selection of programmes from some very random games, featuring a number of clubs that I will never get to see again. Scarborough went bust a while back. 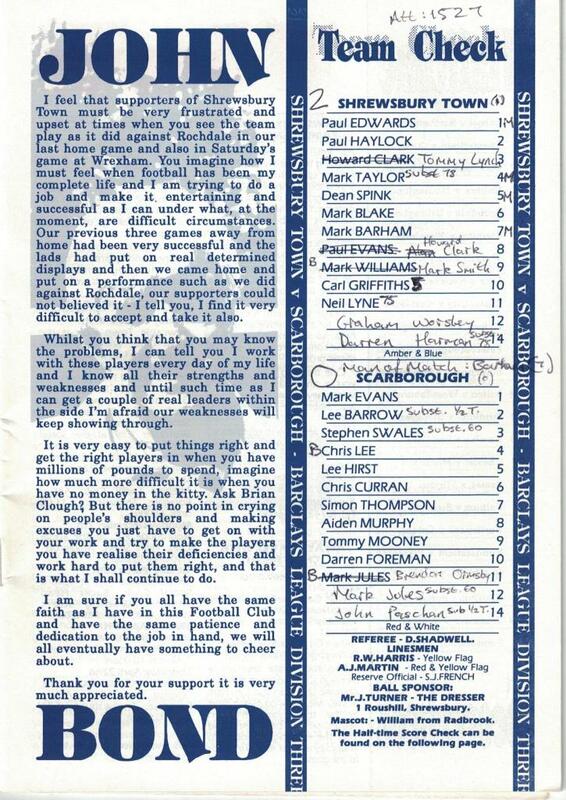 A new club has formed, Scarborough Athletic, but they are a long way off returning to the league. 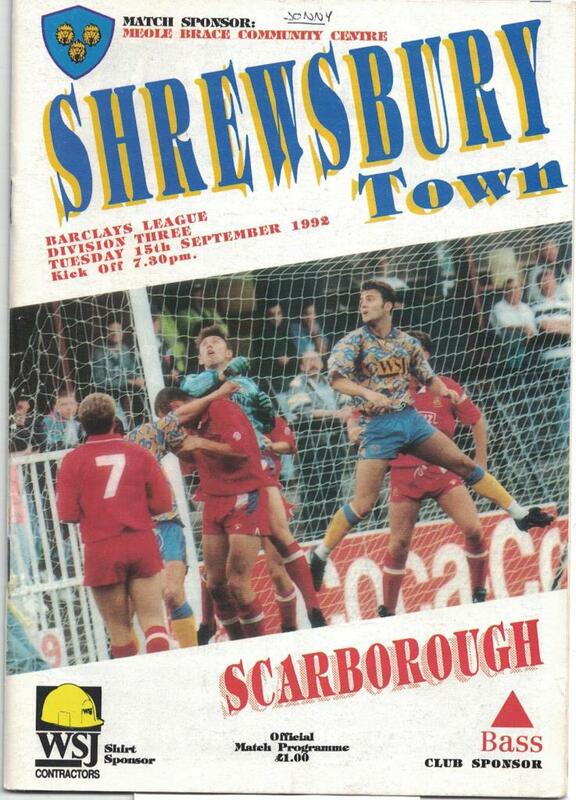 This programme was from the era of Shrewsbury's "scrambled egg" shirt designs, which is now being sold in the club shop as a retro item. At the time we mocked it as horrible. Even in the 90s, which was a decade of horrible shirts. Wait 25 years and it's cool again. I blame hipsterism for this. 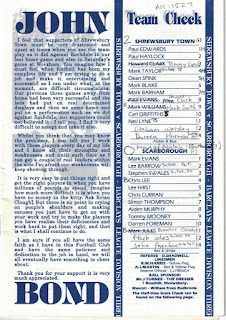 I'm mainly including this to show how I used to deface football programmes with my own notations. I gave Mark Barham my man of the match award. 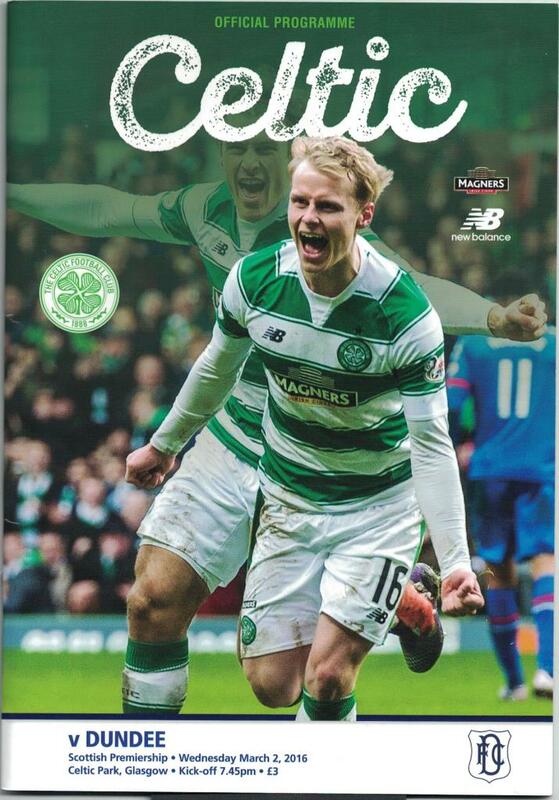 I vaguely remember him having blonde floppy 90s hair and being a winger. I could well be wrong. 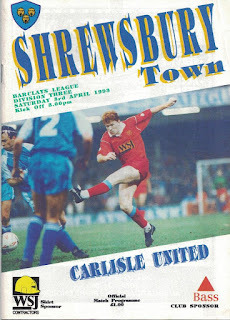 I'm only including this because the cover star is flame-haired full-back Tommy Lynch! 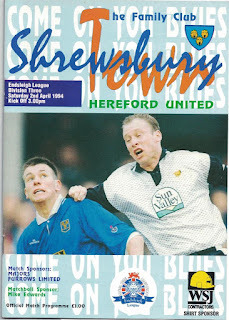 Shrewsbury v Hereford - Div 3, 2 April 1994 - birthday football! Got to love going to a game on your birthday. Not as memorable as the Newcastle game I went to 11 years later (see here for more). Also, typical Shrewsbury photo choice with more of a gurning Hereford player than the Shrewsbury player who is being out-jumped for the ball. I think that's Gary Patterson, who I thought was crap but lots of other Shrewsbury fans loved. Another disappeared club. 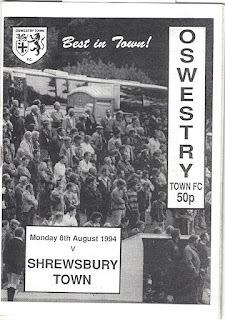 This fixture will never happen again as Oswestry Town were absorbed by the TNS monster, who moved in and became The New Saints. This is why I always think of the league below the football league as the GM Vauxhall Conference, even though it's been rebranded multiple times. The power of imprinting! 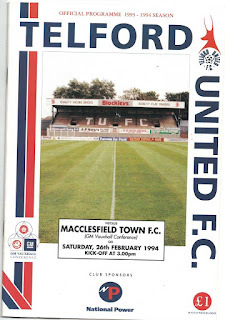 Telford were founder members of the national league below the football league. 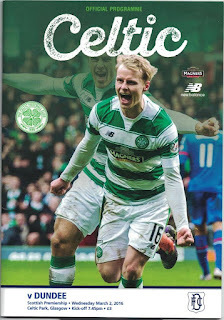 The programme cover shows the main stand of the Buck's Head. Rebuilding the ground in the 2004-05 season bankrupted the club owner and the club. 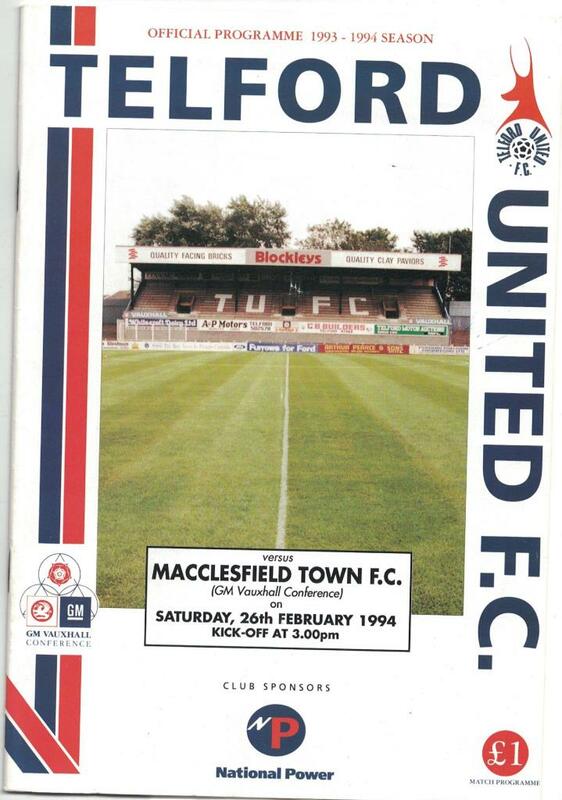 They relaunched further down the leagues as AFC Telford United. Their new ground is quite nice, but they have never sustained the heights they were at in the 80s and 90s. 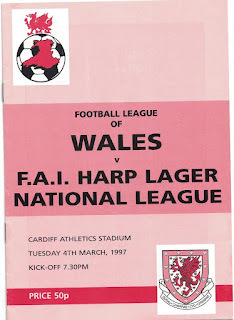 Next up, a Wales B international - do they still do these? This was in 1994. 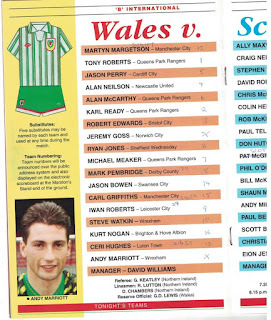 We went mainly because Carl Griffiths, ex-Shrewsbury striker, was selected for the Wales squad, and it was played at Wrexham's Racecourse ground which was less than an hour away. There are some random players in this line up. 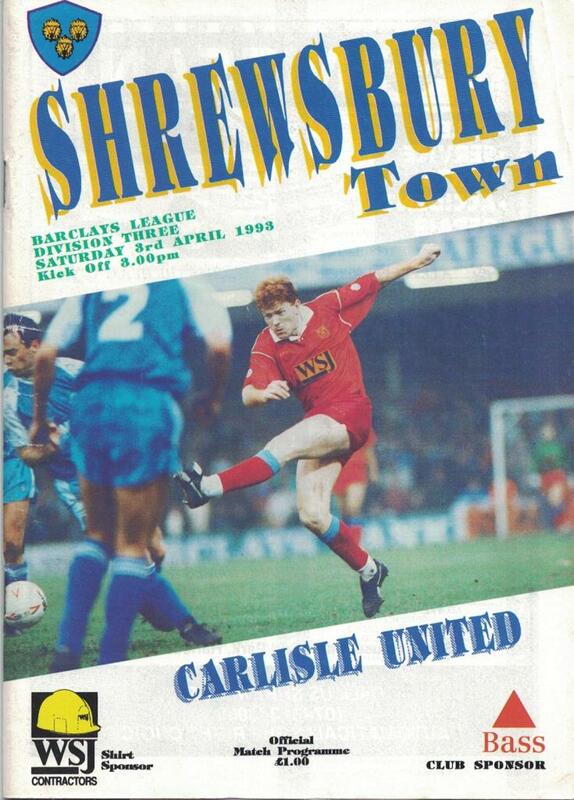 I still defaced programmes back then, so we can see that Carl came on as a sub. In 1994 I moved to Cardiff. I went to a few City games, but it didn't stick. So I drifted to other games. Here's another team that has disappeared - Inter Cable-tel. Technically their opponents, Barry Town, are a phoenix club now as well. 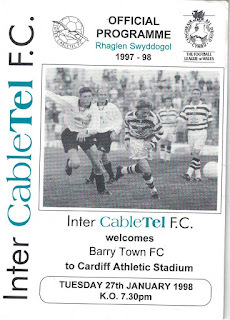 This was the era when Barry bossed the League of Wales, although this was a league cup game. The League of Wales is now the smaller Welsh Premier League. 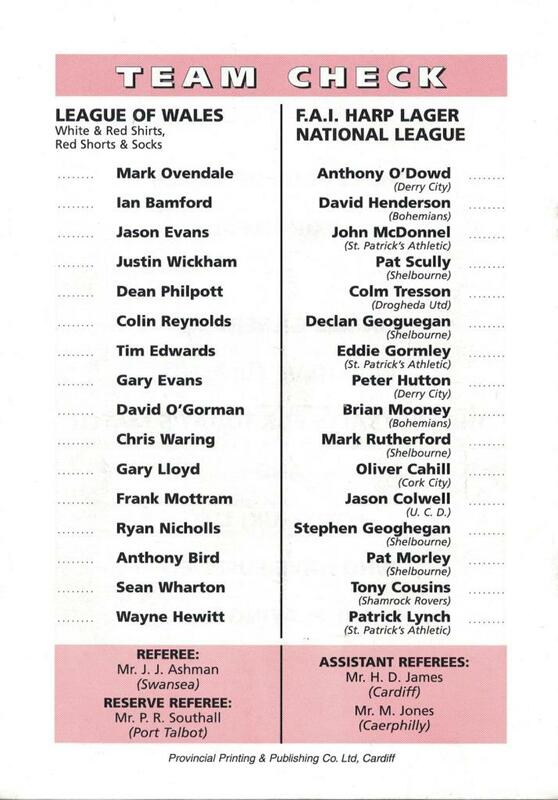 So both these clubs and the league they were competing in have either disappeared or been considerably revamped. The ground it was at, Leckwith Athletic Stadium, was bulldozed when Cardiff City relocated over the road from Ninian Park and built their big new CCFC Stadium. There is nothing about this game that could be repeated. 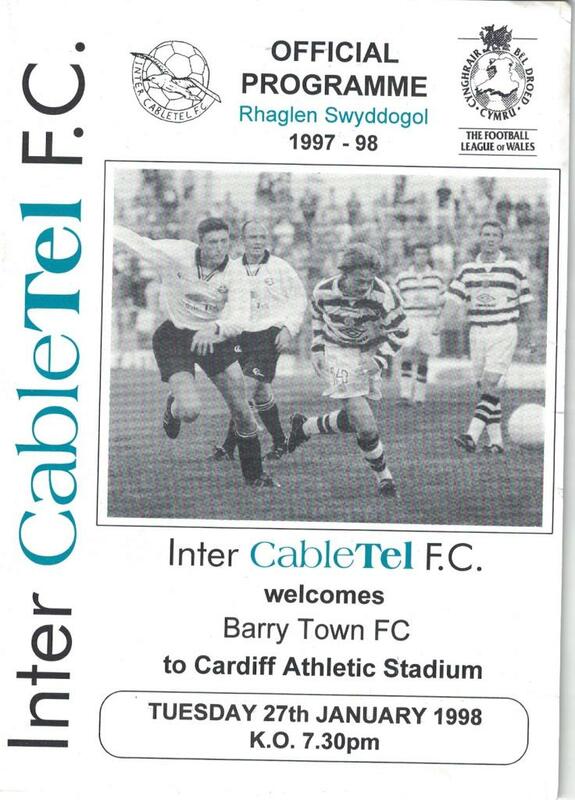 The next season, Inter Cable-tel had reverted to their original name of Inter Cardiff. 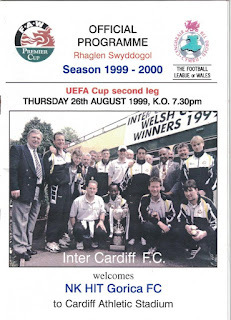 That's a cleverly cropped photo of them, saying Inter without the suffix, with the Welsh Cup on the cover of this programme from a UEFA Cup qualifier in 1999. A note inside the programme reminded me that the half time entertainment was provided by the Tongwynlais Temperance Brass Band. 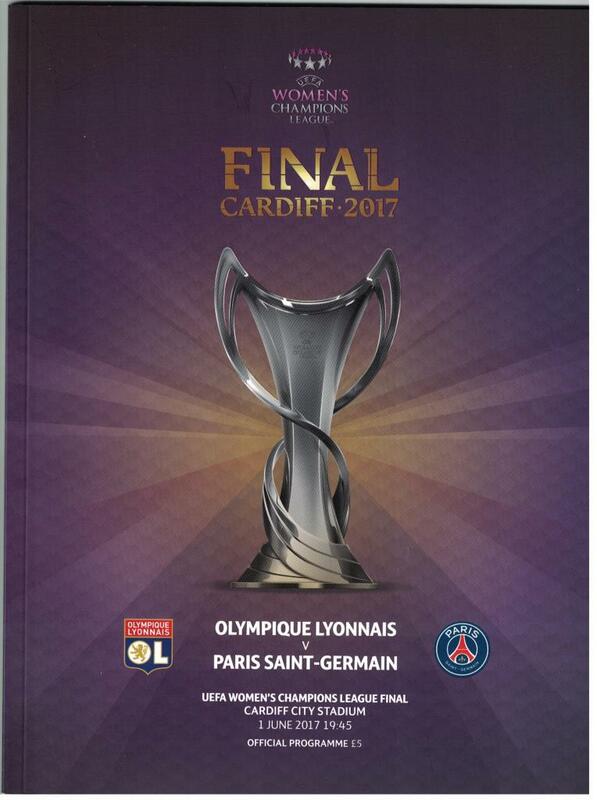 Thinking about it, that's a cup competition that's gone as well, replaced by the Europa League. Everything changes. 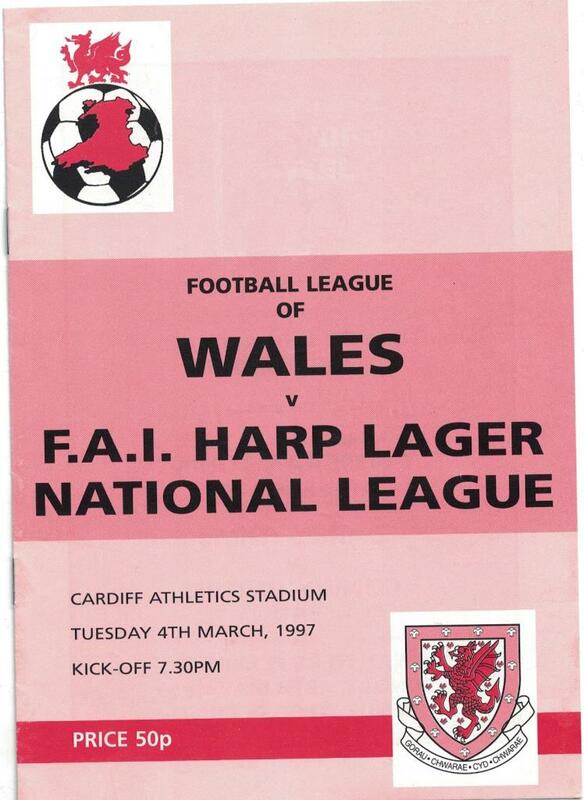 Here's another game unlikely to be repeated: League of Wales v League of Ireland, 4 March 1997. 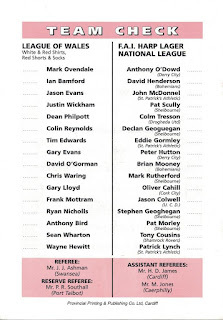 My main point of interest on the night was the appearance of ex-Shrewsbury winger Mark Rutherford in the League of Ireland team. 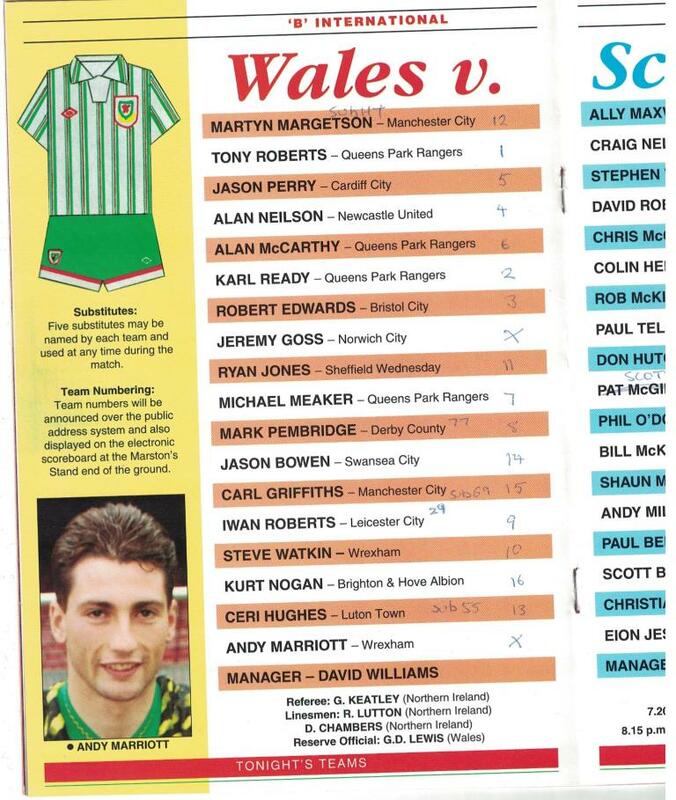 But this LoW squad list is a who's who of late 90s Welsh domestic footballing talent. 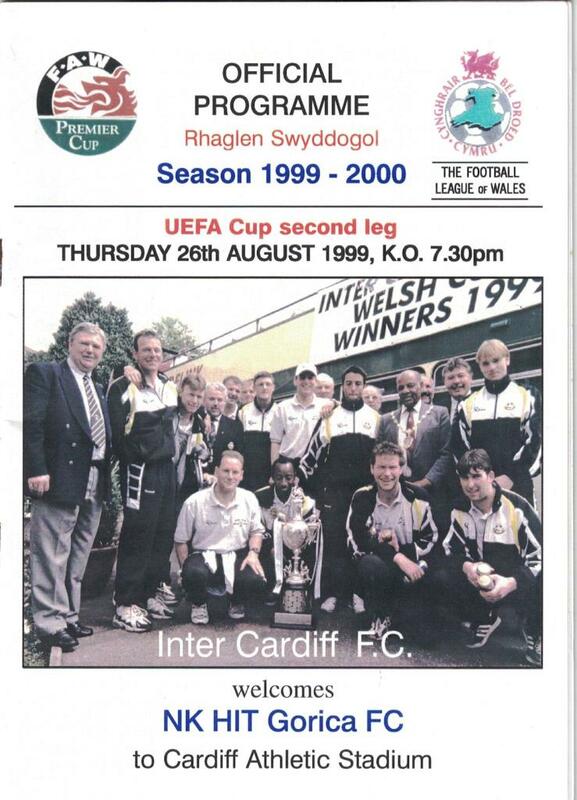 Several players in the squad played for Inter, so this was like a home match for them, as it was played at Leckwith. 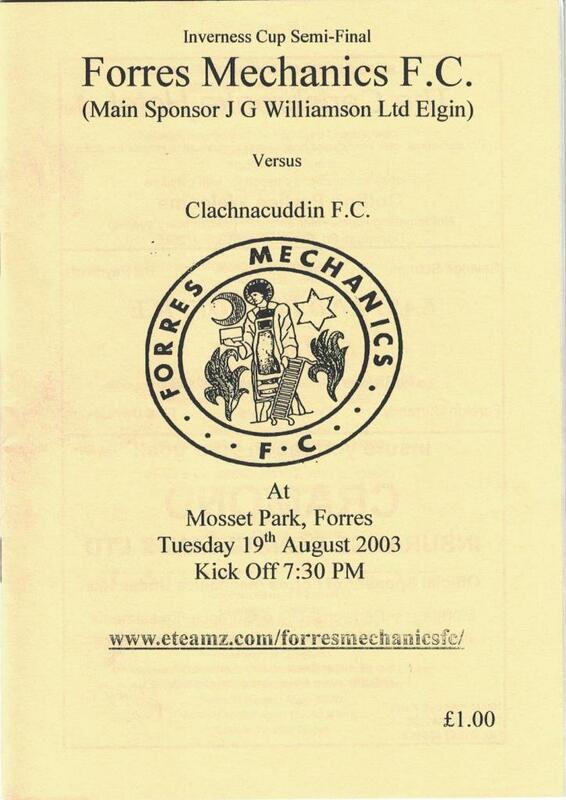 Moving on to Scotland - have you ever seen an Inverness Cup game? I have. I've already said how my football match tally is influenced by my Dad's love for going to football matches. (Something I've caught.) We were on a family holiday to the Moray coast and Dad found this game was on. 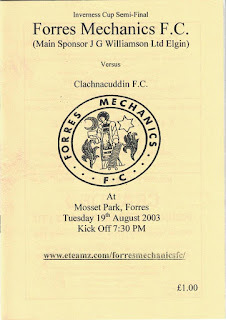 Forres Mechanics are known as the Can-Cans and play in the Highland League. Clachnacuddin are from Inverness. A few years later and I was in Glasgow for a work conference. Celtic were playing at home so I sloped off one night to watch them. It had been a boyhood ambition to go and see Celtic play because one of my best friends, Ed, was Scottish and supported them. The game was pretty dire and finished 0-0. But I had a great time anyway. Another unlikely to be repeated opportunity - seeing a Great Britain international team. I went to the 2012 Olympics match played at the Millennium Stadium against Uruguay and Team GB won. I can't remember if Craig Bellamy played, but he looked alright on the programme cover, despite that honest-to-goodness disaster of a kit. 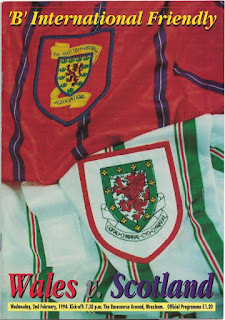 The game was a double header with Mexico v Switzerland beforehand. Football should do more double-headers. 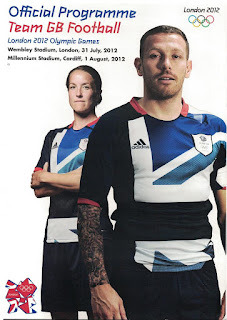 I also went to the third place play-off game in the Olympics because the brochure said it would include the bronze medal ceremony, which I thought would be a unique add-on to a football match. But then they announced just before kick off that the medal ceremony would be the following day after the final and the third place winners would receive their medals alongside the gold and silver medalists. I felt cheated by that and, frankly, the Olympics can do one for me now. I've been to several football matches at the Millennium Stadium. In 2005, while Wembley was being rebuilt, they played a lot of cup finals there. 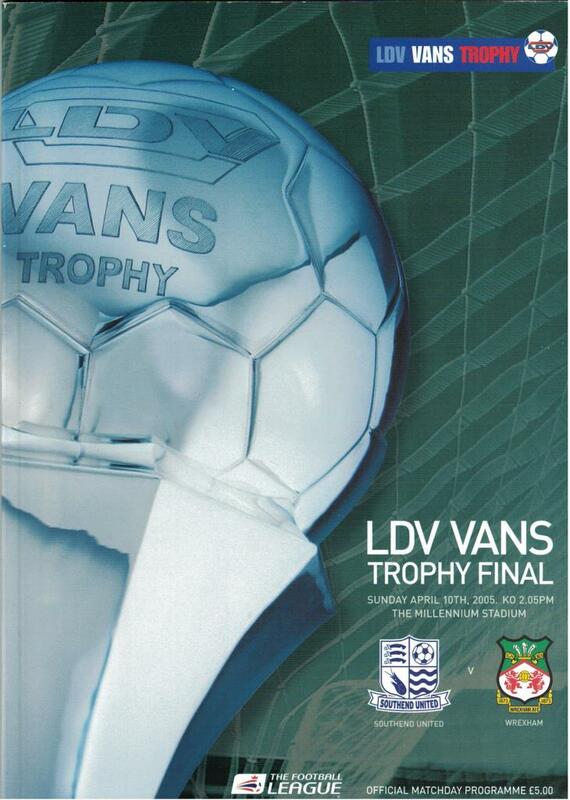 Including the LDV Vans final between Wrexham and Southend United. My Dad came with me, reliving his youth as a Wrexham fan, and also a couple of guys from work who supported Wrexham. When the game went into extra time I remarked to one of them, Pete, that I always felt extra time gave you more for your money. He wasn't happy about that - he wanted the stress to be over! He was happy at the end of extra time though because Wrexham had won. And finally, to another cup final in Cardiff that went to extra time. It was my first women's football game, which also featured two goalkeepers taking the decisive penalties in the shoot out. I've blogged about it in more depth here. Looking through my programmes was a mixed bag of memories. Some good, some bitter-sweet. It's a real reminder of how much the game has changed, and yet, it's still at it's heart the same game. I'm going to do a post with some Shrewsbury-specific highlights next. And then a fun one to finish this short series.